Viktor Ahn of Russia celebrates winning the gold medal in the short track men's 500m on day fourteen of the 2014 Sochi Winter Olympics at the Iceberg Skating Palace on February 21 in Sochi, Russia. SOCHI, Russia — Viktor Ahn of Russia won Olympic gold in the 500 meters Friday, giving the short track star his seventh career medal in the only event he had never won at the games. 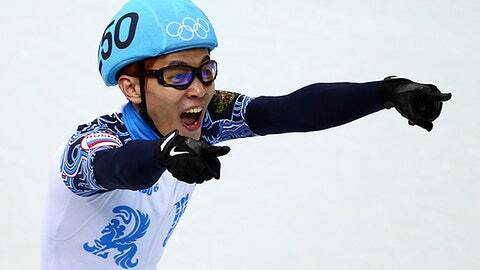 Ahn rallied to take the lead from Wu Dajing of China on the last lap after Liang Wenhao of China crashed out. Born in South Korea, he became a Russian citizen in 2011. Ahn pumped both arms and yelled as he crossed the line first, triggering a wild celebration from the mostly Russian fans at Iceberg Skating Palace. Wu earned silver and Charle Cournoyer of Canada took bronze. Ahn earned a record fifth short track gold and became the first skater to win all four individual short track events at the Olympics.